A former ocean scientist goes in pursuit of the slippery story of jellyfish, rediscovering her passion for marine science and the sea's imperiled ecosystems. Jellyfish have been swimming in our oceans for well over half a billion years, longer than any other animal that lives on the planet. They make a venom so toxic it can kill a human in three minutes. Their sting--microscopic spears that pierce with five million times the acceleration of gravity--is the fastest known motion in the animal kingdom. Made of roughly 95 percent water, some jellies are barely perceptible virtuosos of disguise, while others glow with a luminescence that has revolutionized biotechnology. Yet until recently, jellyfish were largely ignored by science, and they remain among the most poorly understood of ocean dwellers. More than a decade ago, Juli Berwald left a career in ocean science to raise a family in landlocked Austin, Texas, but jellyfish drew her back to the sea. Recent, massive blooms of billions of jellyfish have clogged power plants, decimated fisheries, and caused millions of dollars of damage. Driven by questions about how overfishing, coastal development, and climate change were contributing to a jellyfish population explosion, Juli embarked on a scientific odyssey. She traveled the globe to meet the biologists who devote their careers to jellies, hitched rides on Japanese fishing boats to see giant jellyfish in the wild, raised jellyfish in her dining room, and throughout it all marveled at the complexity of these alluring and ominous biological wonders. 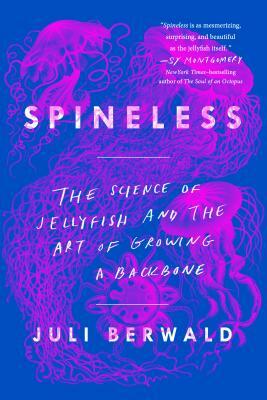 Gracefully blending personal memoir with crystal-clear distillations of science, Spineless is the story of how Juli learned to navigate and ultimately embrace her ambition, her curiosity, and her passion for the natural world. She discovers that jellyfish science is more than just a quest for answers. It's a call to realize our collective responsibility for the planet we share. Juli Berwald received her PhD in Ocean Science from the University of Southern California. A science textbook writer and editor, she has written for a number of publications including The New York Times, Nature, National Geographic, and Slate.